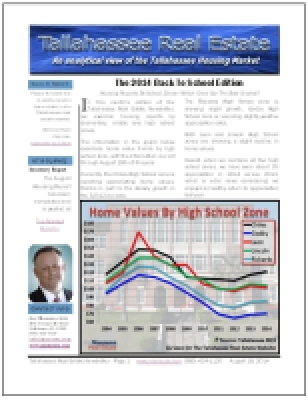 Every year, we like to produce a report (with listings) of the median home in Tallahassee. This means we measure all home sales and find the middle for price, value, and size. Take a look at this year's crop of "median" homes in Tallahassee, and then follow on below to see charts, graphs, and analysis of the median home in 2018. The following list of properties show homes for sale that are very near the median home price, median home value, and median home size in Tallahassee. 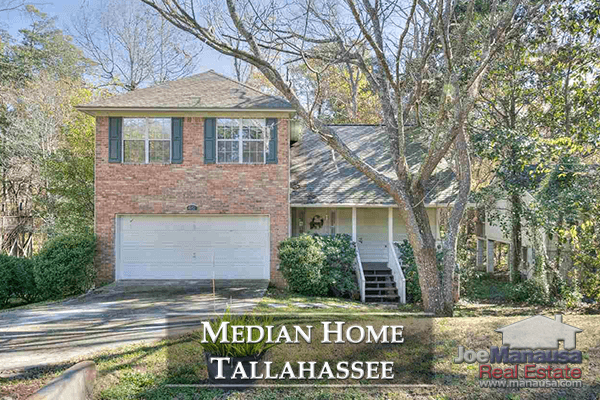 Median: For our report, the median is the "middle" home of all Tallahassee home sales in 2018 found three different ways using price, value, and size. 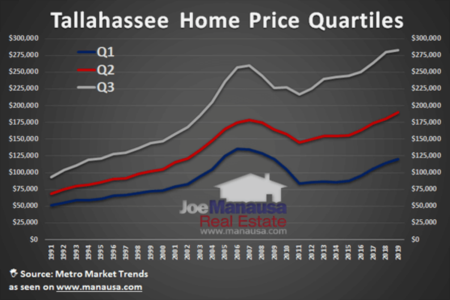 Our first graph shows the median home price in Tallahassee for each year, from 2003 through 2018. The median home price thus far in 2018 is $185,075. For existing homes, the median price is $175,000 while new homes have a median price of $309,700. It's worthwhile to note that the median existing home price is exactly the same as it was in 2017, while the median new home price has jumped 8.7%. Our second graph shows the median home value in Tallahassee for each year, from 2003 through 2018. The median home value thus far in 2018 is $120 per square foot. For existing homes, the median value is $117 per square foot while new homes have a median value of $172 per squaree foot. Since the end of last year, existing home values are up about 3%, while new home values have jumped nearly 5% higher. Our final graph shows the median home size in Tallahassee for each year, from 2003 through 2018. The median home size thus far in 2018 is 1,529 square feet. For existing homes, the median size is 1,500 square feet while new homes have a median size of 1,761 square feet. This year, the median home size has dropped 3.7%. It's interested to note that the median home size for existing homes is 3% smaller than last year, while the median home size for new homes is 3% larger than last year. After taking into consideration what we revealed in the three graphs above, the following table shows all homes that are reasonably close to being the median home in Tallahassee. 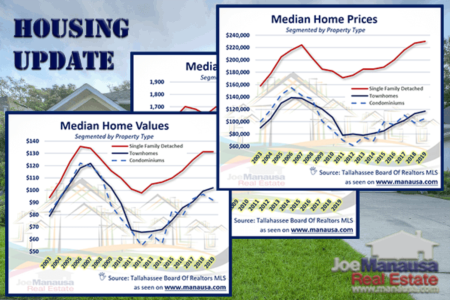 This concludes our 2018 update on median home sales in Tallahassee, please give us a call at (850) 366-8917 or drop us a note if you have questions about anything to do with Tallahassee real estate. Do you want to know who we are? Here's what people are saying about working with Joe Manausa Real Estate, you can see hundreds of real customer reviews reported on Google, Facebook and Zillow right here: http://www.manausa.com/testimonials.